Restaurateur Brian Moy at BLR. If anyone appreciates that, it’s Moy, 36, the restaurateur behind the hot spots Shojo, BLR, and Ruckus, all in Chinatown, where his family has lived, worked, and owned eateries for more than five decades. For him and his relatives — many of them immigrants from southern China, Hong Kong, and Taiwan — the celebrations and meals of Lunar New Year, which begins this weekend, prove a particularly poignant time. They offer a chance to reflect on and rejoice in the family’s journey across the years and around the globe. The holiday will be especially auspicious this year, as Moy’s team has been selected to prepare a special menu at the James Beard House, a New York City foodie mecca, on Friday, which they’ll re-create in Boston at BLR on Feb. 21. In many ways, the Moys represent a changing Chinatown, demonstrating how the neighborhood increasingly blends East and West, past and present, traditional and contemporary. Their restaurants, especially the next-wave ones launched by the first-generation-American Moy himself, have evolved to serve a changing clientele: diners who now make Chinatown a culinary destination and those who live in the ever-more gentrified, and diverse, district. Moy’s father, Ricky, was born in a small village outside of Taishan, in southern China, then moved with his family to Hong Kong when he was 6 or 7. Money and food were sometimes scarce, but New Year’s offered a rare opportunity to indulge. In 1966, when Ricky was 17, the family came to Boston. As one of his first jobs, he was a busboy at China Pearl, on Tyler Street, later waiting tables there. He’d go on to start several small businesses in Chinatown, eventually buying the traditional restaurant Ho Yuen Ting, on Hudson Street, in 1982, and turning it into the more cutting-edge Best Little Restaurant. Six years later, he came full circle, purchasing China Pearl and reopening it as the second spot in Boston to offer dim sum, a Hong Kong specialty. At the restaurants he’s subsequently opened, Moy has shown a similarly innovative streak. With its kung-fu noir aesthetic and hip-hop-heavy soundtrack, the six-year-old Asian speakeasy and small plates spot Shojo became Chinatown’s first contemporary craft cocktail specialist, while his 2016 reboot of Best Little Restaurant as BLR respectfully, but playfully, adds modern and Western accents to his favorite childhood dishes. With the launch of the pan-Asian noodle bar Ruckus last July, he expanded to fast-casual, serving souped-up umami bombs of ramen, udon, and more. That creativity will come to roost at the Beard house this weekend. 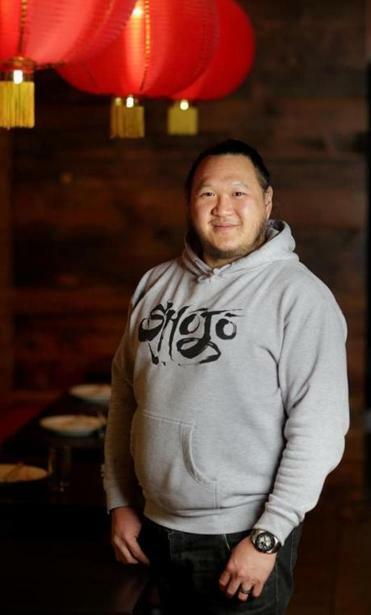 The restaurants’ executive chef Mike Stark — who previously cooked at Tiger Mama and Toro — and Moy have devised imaginative dishes based on traditional New Year’s ingredients and recipes. The significance of many of these New Year’s staples comes less from flavor and more from phonetics, Moy explains: “We eat boiled lettuce because the word for ‘lettuce’ sounds like Chinese for ‘life,’ and then a stir fry of dried oysters and black moss because ‘oyster’ sounds like ‘good new life,’ and ‘black moss’ like ‘prosperity.’ ” For the Beard dinner, Stark has turned that moss into a foam, which he’ll use with caviar and borage to top a marinated and smoked Kumamoto. This time of year, Chinese cooks also traditionally make a starchy soup with the taro-like tuber arrowhead. The small root’s bulbous shape, with a shoot coming off the top, suggests the male anatomy, so it’s associated with the birth of sons and the continuation of a surname — good luck for a family. Rather than a thick stew, Stark will make a soup, adding pork trotter, Matsutake mushrooms, and braised lettuce, topping it with an arrowhead crisp. Eventually, Ricky needed more help. He asked his son to run the original China Pearl and daughter Patricia to look after the branch he opened in Quincy. After a while, Moy wanted to strike out on his own, serving his kind of fusion food, playing his kind of music, in a space that looked, he says, like “you were in my head.” That became Shojo. Andrew Sessa can be reached at andrew.sessa@gmail.com.